Napoleon won a great victory at Dresden, but many historians believe his sudden illness—uncontrollable diarrhea and vomiting—prevented him from organizing an effective pursuit of the retreating Allied army. It underscores the fact that the emperor was plagued with bouts of ill health during the last decade of his life. Napoleon had occasional health problems before 1810. He seems to have experienced seizures one or two times, episodes that resembled epilepsy, although most medical historians feel that he did not have the disease—at least not a classic version of it. But in the main his health was good well into his thirties. “Work is my element,” Napoleon once declared. “I was born and made for work.” Eighteen-hour days were not uncommon, and in one celebrated incident he dictated 102 letters to several teams of secretaries over the course of two days. Such activities were hardly the workload of a sick man. But Napoleon’s health took a turn for the worse after he reached the age of 40. He started getting chubby, a plumpness that soon became real fat. Official portraits, like David’s celebrated work, still showed the emperor with a trim waistline. But a few candid sketches—and a few surviving uniforms from the period—tell a different story. The Russian campaign provided the first real evidence of the emperor’s declining health. The night before the Battle of Borodino, Napoleon caught a bad cold, and this in turn triggered an attack of dysuria, a bladder condition. Doctor Mestivier, his personal physician, noted that Napoleon had a bad cough and was having trouble breathing. The doctor noted other symptoms as well. The emperor’s legs were swollen, his pulse was irregular, and he had periodic shivering fits. Napoleon himself complained to his valet of feeling sick—a startling admission for someone who rarely admitted any kind of weakness. Napoleon’s illness may have affected his thought processes. He rejected Marshal Louis Nicholas Davout’s suggestion that they outflank the Russian forces, opting instead for an unimaginative and bloody frontal assault. For the most part Napoleon was passive, even lethargic, at Borodino, seemingly more interested in nursing his cold than in taking an active part in the unfolding drama. Napoleon at Fontainebleau, March 31, 1814. As Napoleon’s health declined, so did his decision-making abilities, although he was still capable of real brilliance in planning and executing a campaign. But after 1810 there were more and more moments of indecision, of hesitation, than had been seen in earlier years. After the Battle of Maloyaroslavets in 1812, he agonized over which route the French army could take in retreat. The Russians under Marshal Mikhail Kutusov blocked the way to the southern route, which promised to offer more food. The Napoleon of old would have attacked without hesitation. Instead, the emperor avoided battle and chose the Smolensk-Moscow road, already devastated and stripped bare in the campaign. The decision sealed the fate of the Grand Armée and turned a crisis into an unmitigated disaster. Ironically, Kutusov retreated shortly thereafter, leaving the door to the southern route open. The tragedy began even earlier, when Napoleon lingered too long in Moscow. Week after precious week was wasted while Napoleon mulled over his options. Wishful thinking had replaced hard-headed reality, as he convinced himself that somehow the czar would see reason and negotiate. After the Dresden episode, the emperor never seemed to be fully well for the rest of the campaign. Once again, as in Russia, Napoleon seemed incapable of making up his mind. These bouts of indecision were accompanied by periods of despondency and outright depression. During the Battle of Leipzig, on October 17-18, 1813, Napoleon was seized with violent stomach pains, so terrible that he doubled up on his camp bed. “I feel bad,” the emperor complained. “My mind resists but my body gives in.” Some have attributed this particular attack to doudentitis, triggered in part by anxiety. 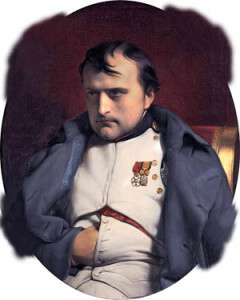 Periods of ill health dogged Napoleon for the rest of his days. He was indisposed the night of June 16-17, 1815, after his victory over the Prussians at Ligny, and wasted the morning of June 17 reviewing the troops instead of seeing how Marshal Michel Ney was doing with the Duke of Wellington at Quatre Bras. Once again, the emperor’s ill health was accompanied by a curious lethargy that was ultimately fatal to his cause. Napoleon once declared that one had only a short time for war. Plagued by illness, lethargy, and indecision, Napoleon in his last decade illustrated the sad truth of his own assertion. Tags Battle of Borodino, battle of dresden, Battle of Leipzig, Dresden, France, Grand Armée, Ligny, Maloyaroslavets, Marshal Louis Nicolas Davout, Marshal Michel Ney, Mikhail Larionovich Golenishchev-Kutusov, Moscow, Napoleon Bonaparte, Napoleonic Wars, Prussia, Quatre Bras, Russia, Russian Campaign, The Duke of Wellington.